The rapid adoption of digital has seen brands transform their in-store experience into something greater – much to the delight of their customers. Beauty giant, MECCA Brands, is no exception. With the help of Prendi’s digital expertise, MECCA Brands has taken a big leap towards a digitally connected future for their brand; a vision founder Jo Horgan has wanted to achieve since opening the first store back in 1997. After attending The Digital Future of Retail, an online webinar with Prendi’s Managing Director James Ingram, MECCA Brands made contact with the Brisbane based agency to begin the process of integrating digital into their in-store environment. “It has been great to partner with a company passionate about integrating digital into their stores. They are open to new and innovative ideas and have really begun to embrace the possibilities,” says James. The initial unveiling of the first connected MECCA store was at their Melbourne Myer Pad. This location features a total of six 2×1 55″ portrait columns plus a giant 65″ single landscape display. The impressive size and the high-resolution display is used to enliven the space, championing the latest international brands and beauty campaigns. Additional MECCA Maxima stores have now been re-vamped, including at the iconic Chadstone Shopping Centre. Identifying the need amongst their community for greater connectivity, MECCA has integrated social media capabilities to enhance the conversation both online and in-store. Integrating platforms for customers to create their own, personalised content to be easily shared amongst their network. MECCA’s front-row glamour is taken to new heights with the ‘Selfie Station’, enabling shoppers a fun way to go social with their in-store experience. Within a photo booth station – the interactive display prompts individuals and groups to “step into their most flattering light”, taking snaps and personalising the filters and GIFs before sharing online. The selfie station combines a custom enclosure, lighting and camera with a touchscreen application. Prendi handled all interactive application development and hardware deployment for the Selfie Studio. MECCA has made accessing product information a more seamless experience by introducing their popular #MECCABeautyJunkie YouTube videos into the in-store environment. Built into the Beauty Bars located at the centre of the store, the 10” displays enable customers to view and simultaneously try products prior to purchase. The application features a range of different make-up techniques, making the in-store experience more informative and seamless than ever before. 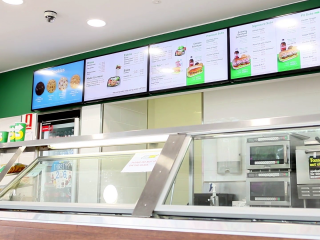 Prendi was in charge of installing screens in different configurations to show custom animated content to enhance their brand and messaging. Multiple layouts were decided on and reused across multiple stores to allow ease of creating content, and drive digital engagement in-store. Integrating interactive technology is the first step toward creating a modern in-store experience – a necessary investment that drives value to all stakeholders. Prendi is proud to partner with MECCA and contribute to the evolution of their brand experience. 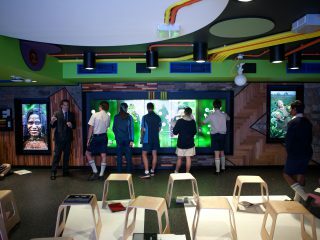 Previous Post (p)	A Classroom of the Future: The Wonder Room.